Apart from buying lunch a few months ago when we travelled away for a friend's funeral, I haven't bought tea, coffee or water to drink while I've been out for years. The reason? Well, you know the frugal word will be in there somewhere, but it's also because I realised it was a habit of convenience and now that habit is broken. The lunch we bought a few months ago also made me realise that now, many shops are serving their drinks in disposable cups, with disposable spoons, sugar and milk in single serve containers, oh, and while you're about it, take a single use napkin. What a waste! It is so easy to get out of the habit of buying drinks while you're away from home. I must tell you I have a bit of a thing about people in shops preparing drinks (or food) for me. I watched a girl serve a milk drink at a cafe a few years ago, and when she spilt some, she licked it off her fingers! =: O Anyhow, you break the buying habit by having good flasks that will keep your drinks really hot, and you take your favourite drink from home - be that good organic coffee or tea. When I started work at the Neighbourhood Centre I had to start packing food and drink to eat while I was there. I already had a one litre Thermos flask for the black organic tea I like to drink, but I found that over summer, it's also very good for taking lemon cordial with lots of ice. My good friend Kathleen bought me a great little lunch box a few months ago, one that has a little freezable ice block as well as some small containers that all fit together in one box. It's great for taking nuts, salad, leftovers, cut up fruit, or anything that my heart desires. I like taking a good lunch to work, because I usually share it with whoever is in the office and often the person I share with has not had home made food for a long time. Even a homemade sandwich is a real treat. You can see the post I wrote about that here. So it probably won't surprise you to know that last week I bought another Thermos, this one holds 1.8 litres. It was bought mainly for our trip on the train, so we'll have enough tea with us for the entire trip, but it will also be used when we travel away in the car, or any time we'll be away from home for the day. 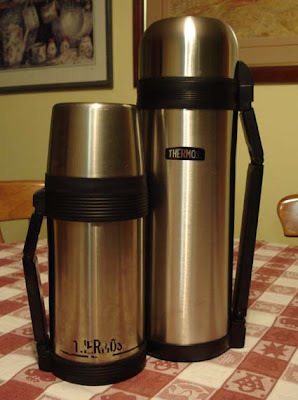 Having enough tea for the two of us for a full day is great, and I wonder why I hadn't thought to buy a larger Thermos flask well before this. In the week since I bought the flask, it's been earning its keep by keeping tea hot for us during the day. We usually drink tea at breakfast, morning tea, lunch time, occasionally for afternoon tea and sometimes for dinner. I've been filling the flask up in the morning after I make our breakfast tea and it's there hot and ready for us whenever we want another cup. It holds seven cups, so there's plenty to keep us going during the day. The great thing about this is that it saves time and it saves electricity as the hot water is only heated once. After much thought, yesterday I started work on my simple living ebook. I'm pretty excited about it too as I've thought of a few things that will make it really useful and interesting. I wonder if you can help me with something, and I'd like to get as many opinions as I can on this - like everyone who reads this, including all the lurkers. : ) If you bought the ebook, do you think you'd print it out and put it in a folder, would you just print out the pages with instructions on them, would you read the entire thing on your computer? Or if you have any ideas about use, please let me know them. It makes a difference as to how I do the layout. Thanks your your help. It would be a print out put in a folder for me. I Love your writings so helpful . Definitely printed out and put in my home management folder. I have sent you the Nice Matters Award in my last post, for a lovely blog. We love our vacuum flasks too Rhonda. We have one with a wide neck which is easier for things like chunky soups. I'm buying my son and daughter-in-law a couple for Christmas after my son won a small one at work and loves it. He has a long train trip to work and now has a hot drink along the way. He used to say they were only for old fogies who sat at picnic tables in parks to eat their lunch. Haha. At thirty four he is turning into one of those old fogies. As for your e-book Rhonda. I'm so pleased you decided to do it after all your work. I'd be printing it out too. I can't look at a screen for too long and I also wouldn't want to have to turn the computer on every time I needed to refer to it. during cooler weather this winter my daughter took a smaller Thermos flask to school with hot chocolate in it, and loved it! i would definitely print out an ebook as I'd prefer a paper version. I guess I'm of the younger generation, because I would not print out an e-book. I already keep my recipes on my laptop and cook from the screen rather than paper, but then my laptop is an older laptop that I can afford to have in the kitchen. I do prefer to read things from paper, but I am keenly conscious of the way I waste paper at work so I dont wish to add to the crime at home as well! Plus I figure if I can read thousands of words of blogs each day on the computer screen I'm sure I can get used to reading books that way. Re e-books, I only ever print out those recipes, patterns and instructions that I want to use now, for which I can't remember the details easily, and which I am likely to want to keep in a folder for re-use. If I print often from one source, I then look for the lovely professionally published, silky paged gorgeously illustrated version to buy. Printer paper really doesn't do it for me except for short term convenience. I like those sites that condense each topic's text and illustration into print friendly single pages with no ads for printing, with a Print Me button and Send by Email button (to tell friends about an interesting topic easily) next to the Comment button. For me the format for an ebook must also suit screen reading to be successful - big text, small pages, faultless page navigation mechanism and a very comprehensive Contents and Index. I too would only print out recipes/pages of interest as like Louise my workplace go through a lot of paper. I tend to print out things for immediate use. Having said that I still love to borrow books from the library to read! I would print out the pages with instructions. Ah, the Thermos! Wonderful things. We have a few - one litre and a two litre and a soup flask. And the e-book: as much as I detest using too much paper, I don't tend to like reading a book online so would print at least some of it out. A book to me is something I lay in bed reading with a cuppa, or take in the car whilst I wait for a son at the train station, - that sort of thing. Instructions I tend to leave online or save to disk. Another thing too is that my house is powered by renewable energy and so I need to be mindful of my power usage; therefore I switch off the computer as soon as I can. I save things to disk and use recycled paper to print out others on. I think with the ebook I would probably only print out pages with instructions and recipes. My work wastes obscene amounts of paper so I am always mindful of that. Not to mention the cost of printer cartridges!! I agree with Marg about making it very easy to navigate around. The email to a friend link sounds like a great idea. I don't like reading whole books on line, so tend to print out some of it but not usually all the book because I feel guilty about the paper and ink used. Books are for in bed or by the fire or waiting in the car really anywhere that I can get away with reading. I love my thermos too. Used to be embarrassed when I would go anywhere with my parents and they would take the thermos and sandwiches to have on the side of the road somewhere. Hey life is a circle, now I do just that. Not sure if my kids are embarrassed but I don't really care. My daughter has headed off to school today with noodles in the thermos. I might try the tea idea while at home. I often boil the kettle a few times before I make my drink because I wander off while waiting for it to boil then by the time I'm back it's cooled too much. Hi Rhonda! Have a WONDERFUL trip, enjoy your scrumptious lunch, the other passengers will be envying your goodies. hello! i have never purchased an ebook and for some reason am not sure why i'm opposed to the ebook idea. i prefer going to the library or the used book store and having the book in my hands, where i can sit comfortably, have the book at different angles, etc. so in my ideal world, while it's not completely environmentally friendly, i would love for you to publish and have available for purchase your book. yes, i did say purchase, for you, i would definitely purchase the book! :-) i love your advice and it would make a great reference for many many years of usage. p.s. i know you started it but can i at least nominate you back for the frugal subversives award? cause you're the primary person i can think of and i just got nominated again! Another thermos fan here too. I usually boil the jug once a day and fill the thermos for my coffee fixes, which can sometimes be too many when the weather is a bit cold! Also, re the e-book, I'm another print out and put in a folder to read at my leisure person. Hope you & H have a wonderful holiday, your train trip sounds just long enough to enjoy the novelty of a train trip and not too long so you get sick of being in a confined space for too long. Safe journey and look forward to the holiday stories when you return. I would print out parts I use as I don't like to read for long on-line. I would go somewhere between the two extremes....print out the bits I would like to have to hand so I don't need the computer on to reference them, and leave longer more discursive material for the ether. I've also never bought an e-book, but like many of us, we receive so much info online for work, I don't imagine it would be all that different. Count our family of five as thermos afficianados. We have a large one, a soup thermos, and a little one that's just the right size for hot milk....and pickle sandwiches are in my top 5! I would love to print it out as all my reading is done in the bath. To bigger risk of electrocution to read it on line lol. hee hee! I love the idea of Kristy reading in the bath - I do the same lol! Rhonda I travel heaps for work, and REFUSE to buy bottled water, so I always keep a 5 litre water joey in the boot, filled with rainwater and carry a 750ml bright pink bidon type waterbottle with me everywhere! Have a lovely trip ok! Have a safe trip and please take lots of pictures. I live in the midwest U.S. and I'm highly unlikely to ever get to Australia. I would print out the e-book and put it in a folder. I'm a lurker and thought I would stop by and say hi...I love your blog and have been finding so much inspiration on our journey to a more simple life. I think I would print out your e~book to save and read at my leisure, as I too find sitting at the computer and trying to read at length a strain on my eyes. I hope you and your husband have a wonderful and safe trip! I would print out the pages I would like to read and the rest I would save to read later. I, also, like a real book to take with me places, but since you print out it seems almost the same. I found a great site called lulu.com where you can sell your book and they do the printing for you. Just a thought! I hope you have a wonderful trip. Maria S.
I have to say I'd print it out and put it in my binder. I'm not fond of reading on the computer. I would read it on the computer and print out a few pages as I needed them. Enjoying your blog.